We have recently made an exciting addition to our wedding facilities with a new dedicated ceremony space! 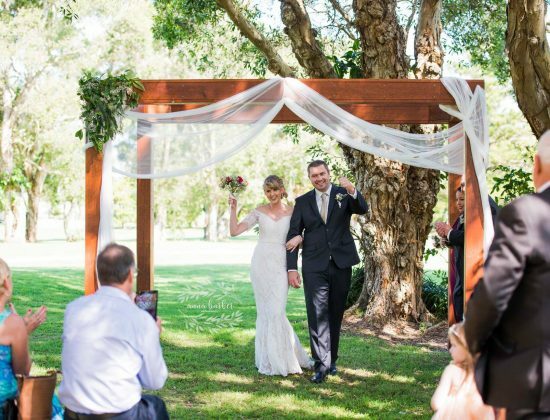 Featuring a stunning timber arbour and shaded by beautiful paperbark trees, the space offers our wedding couples and their guests a natural setting that really celebrates the beauty of our area. Find out about the new ceremony location and more from Jo Court, our wedding specialist, read on below. Who made the arbour and what was the idea behind it? We have had a lot of enquiries asking for an on course ceremony location and after visiting other golf courses on the Gold Coast to view their wedding facilities, our Board of Directors agreed that building an arbour would be an excellent extension of our wedding services. It means that guests are already on site and are able to relax after the ceremony, without having to drive to another location for the Reception – it’s all here. For the Bride and Groom, it means that they can go straight out onto the golf course for photos and then straight back to their Reception, which really maximises their time with guests, and also reduces the amount of wedding organisation – as I can assist with all of the logistics and keep it all on one site! There arbour itself was made by Brett Serjeant, one of our golfing members and a local carpenter who also built our amazing Deck. We’re really happy with how it’s turned out, it’s a modern design which is able to be styled to suit many themes. Where about is it located? Is it easy to get to from the Club? The Arbour is located around 100m from the club, so it’s very accessible. It is an easy flat walk on a path and for any guests who may need assistance, we are able to provide a couple of golf carts with a driver to transport them. Many of our elderly guests have never been in a golf cart before, so they absolutely love it! How many guests can you have at The Arbour on Course? There’s no limit to the amount of people that we can accommodate at the arbour as it is an open space, however with the wet weather option being The Deck, we would say up to 150 people. What is the cost to utilise this ceremony location? The cost is $250 for the use of the area, any seating/ styling would be an additional cost. We are able to assist with recommending theming companies in the area and providing you with ideas. We have had a few ceremonies at the Arbour now, and all of our couples and their guests have loved it. It has been described as very peaceful, natural and green. The sounds of paperbarks rustling and birds chirping can be heard in the background and its a beautiful location for photos with mid afternoon light filtering through the trees. To make an appointment to view the space for yourself or to speak with Jo about how we can be a part of your wedding day, email jo@yambagolf.com.au or call 02 6646 2104.